“Oh you’re going to absolutely fall in love with it. May never come back from the area just like my husband and I,” winked Chris, the gleam of empathetic excitement twinkling in her eyes, while she commanded the bus steering wheel in front of her. Perhaps it was setting the stage, a bus for 40 people, completely empty apart from my warm spirited bus driver named Chris. I was in Sandy, Oregon, aboard the SAM bus route, slowly weaving my way closer to a Salmon-Huckleberry Wilderness trailhead that would guide me the rest of the way. Yet this quick, solo overnight backpack trip was a long time coming: One bike ride, one train ride, one bus that led to another bus, and a three hour hike placed me at the top of my basecamp just as the evening sun was beginning to turn the green forest around me into pure gold. Leaving the trail behind, I scrambled west across the mountain ridgeline, slowly sensing myself inching closer to my destination: Solitude. As I bushwhacked through the trees and rocks, I thought back to my earlier conversations with fellow hikers along the trail, clear final preparation for a quiet night’s conversation reserved for one. Turning left to round a set of boulders, I happened upon what had the makings of a great camp and set my bag down in preparation for dinner. In all honesty, the effort necessary to make it here left me undeserving of such a mystifying place. A four and a half mile hike with minor elevation had prefaced my arrival. I felt my arm, goosebumps beginning to slowly bloom from the cool, rich forest air wafting from my right. I wasn’t damp enough to be sweat worthy of this place. And yet, here I was, the Salmon-Huckleberry Wilderness with a portrait-like expansive view of Mt. Hood, slowly observing its grey andesite face turn to gold with each passing minute. I set aside my jar of peanut butter, popped my final tortilla from dinner into my mouth, and leaned back into my makeshift la-z-boy, a gathered fallen pine branch properly angeled to be the backrest of a flat, smooth faced rock. The green forest below the cliff I comfortably dangled my legs off of creaked and slowly seemed to drift with the breeze. 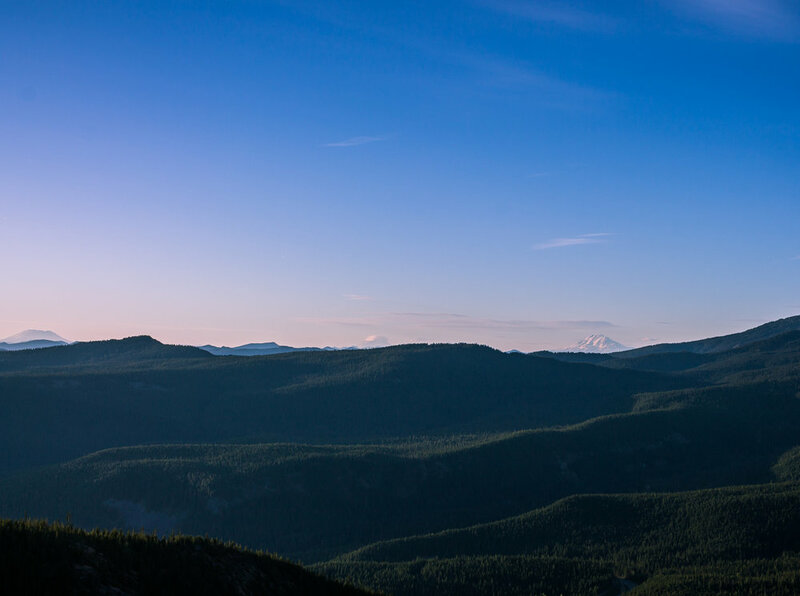 I could see for hundreds of miles, the Cascades to the North stood out against the slowly darkening sky: Rainier, Adams, St. Helens. I closed my eyes feeling the sunset’s golden rays warming my exposed skin. I breathed in deeply with the cool mountain wind. Far too often, I dream of adventure. True adventure, that is, where danger plays a role, and experience, or lack thereof, shapes the outcomes of a trek. Far less often do I close my eyes and picture the likes of my current place: A very different state of extreme serenity, comfort, and lonesomeness. 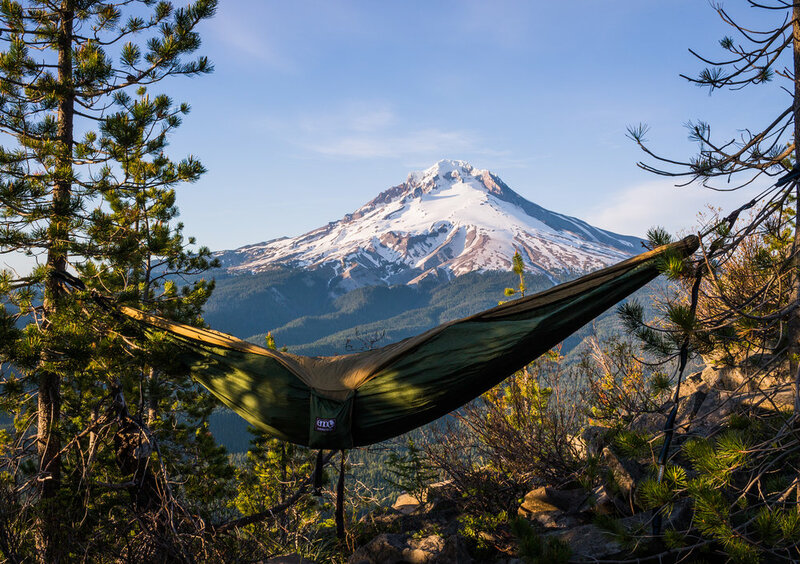 I reached into my bag, slowly packing up my food and exchanged my jar of peanut butter for a compressed hammock before shuffling my way down the ridgeline to a site I had previously scouted. With a clear, uncompromised view of Mt. Hood to my slight right and a thick line of trees and rocks forming a barrier from the freeze of midnight winds, I setup my sleeping situation. I must have only made it to Gemini before the slight wind, the crickets, and the illuminated, snow capped face of Mt. Hood put my bewildered mind to rest. My eyes awoke to a faint light resting behind the dark silhouette face of Mt. Hood. There was a slight breeze moving through the tree line behind me and out towards the behemoth peak I hadn't taken my eyes off of. The sky, though still a deep, dark universe blue, was beginning to unveil tints of pink and purple out from behind the mountain. I quickly grabbed my camera, threw on my fleece, dove my warm, wool encased feet into my boots, and headed west deeper along the ridgeline. Having done my fair share of wandering the previous evening, I knew exactly where I wanted to begin chasing my Mt. Hood sunrise. Half a mile farther down the ridge, a thick grouping of trees dove off the face of a cliff, exposing a window with pine trees to my left and Mt. Hood to my right. The sunrise seemed eternal, as the dark figure of the mountain slowly opened its eyes to a new day. Mt. Jefferson, far off to the South, was clearly visible, its snow capped peak merrily dancing in the light fluffy pink and purple hues of the sky. And to think, I got to be the only visitor in that part of the forest that morning. The Salmon-Huckleberry Wilderness gifted me a remarkable, solemn escape from the bustle of city life I had been surrounded by. A pristine sunset, a clear masterpiece of the universe, and a vibrant sunrise left me feeling energized, grateful, and lucky. It is not often that one gets all three in the span of a mere 24 hours. A conversation with one was expected, even sought after. But I left having shared a conversation with more than myself. Mother Nature was all around, the growing trees, the whistling birds, the hard working ants. I was in solitude, but I was never alone. This trail is one of the popular day hikes of the Mt. Hood area. I have decided to not reveal it’s name, though some easy investigatory work will unearth it for you. While I imagine this is a good day hike if you enjoy having lots of people around, only in solitude does it turn into something magical at night. While I’m certainly not the first to reap the benefits, I believe something this special should only be revealed to those who hunt for it. One thing I will say, however, is that if you already know the trail, spend a night there alone or with no more than two friends. It is magical beauty when the packs of humans leave and nature emerges.